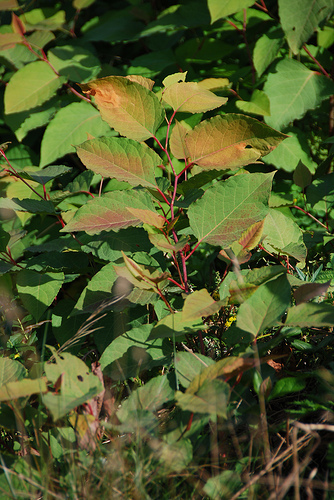 FoAGM made a proposal to the Lexington Conservation Commission in 2004 to eradicate the Japanese Knotweed along a 100 foot section of the Minuteman Bike path. After some research two experimental methods were started in April 2005. One method is repeated cutting of the plant. The second is to dig up the rhizomes and cover the area with black plastic. The following are the reports of several FoAGM members who have worked on the project. Additional volunteers for any size time commitments are most appreciated. For information on how to help out contact Mike Tabaczynski at mjt1@rcn.com. A very quick follow-up to the report I circulated yesterday. Just as it was beginning to get dark yesterday evening, I managed to get over to the JKW site for a half-hour or so to test out the machete. It does appear to be a fairly effective way of slashing through the very large stands of JKW that have grown up among the trees along the bike path. It would seem to be within the realm of possibility to begin a long-term process of repeatedly cutting that JKW once or twice each summer to weaken the plants and prepare for their ultimate removal. There are two immediate downsides to use of the machete. First, I found that when I cut the stalks the large over-story of the JKW plants would fall down on top of me – not inherently a problem except that the blossoms on the plants seemed to be populated with small, stinging ants – fire ants? – that would fall on my neck and down my shirt and sting away, which was fairly painful. Second, I found that I developed blisters on my hands fairly quickly from the rubbing of the handle. The first problem might be solved by working during the daylight hours when one can see better what one is doing. The second might be remedied by wearing work gloves. On the whole, however, I can’t imagine a better-suited or more efficient tool for this kind of job. It is no accident that the machete is the tool of choice for cutting sugar cane and whacking one’s way through the jungle. The long, strong blade and short swing are well-suited to getting through these cane-like stands and working among trees and rocks. A mechanical weed whacker probably comes in second but makes a lot of noise and is susceptible to being damaged by rocks and tree trunks. During the relative short time that I worked yesterday evening, I was able to cut through the rest of the lower bank and also began moving east through the woods a few yards from the waste pile. I am hoping to be able to continue this effort to open up an extended vista of the meadow through the trees as one approaches the current JKW project area from the Brandon Street entry point, and perhaps begin the process of weakening this next huge stand of JKW with a view toward its ultimate eradication. - John B.
I have done a fair amount of JKW work over several evenings during the past week. Here is a quick report for the record. After our Steering Committee meeting last week, I “weeded” out most if not all of the JKW that has continued to re-sprout in the central grassy area. In general, I find that these shoots are fairly toughly rooted. Some will come out with a small section of root but others can only be broken off. At least the area looks better now, clean and JKW-free. Then, over several evenings beginning during and after the intense rain we had last week and continuing into this week, I have tackled the JKW that was growing profusely on the lower part of the bank on the east side of the project area. 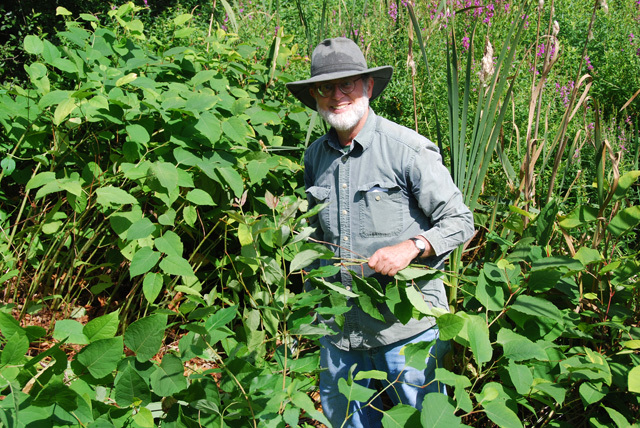 Although most of these plants grew quite large this summer, five to six feet or so – and were completely blanketing the lower bank to the exclusion of all other vegetation – they are definitely showing signs of weakness from our repeated assaults over the past four or five years. My strategy at this point has been exclusively “pull, pull, pull,” grasping the plant at the bottom and trying to uproot as much of the root system as possible. I would say that about 70% can be uprooted along with a good clump of the root system – half quite easily and the other half with a more strenuous tug (which can be a bit hard on the back). The remaining 30% or so are still quite strongly rooted in the soil and can only be broken off. I have also, in accordance with our discussions, cleared out a number of sumacs that are proliferating quite rapidly through the area. At this point, I have cleared out most of the lower bank from the edge of the grassy area through the area immediately below the waste pile. About another hour’s work would finish off the last segment to the east of the waste pile. I have generally been working in the evening, from about 7 p.m. until 8 or 8:30 when it becomes too dark to see any more. It is a bit cooler at that time, and the mosquitoes, though definitely present, have not been too bad. In hindsight, it might have been better to have done this work earlier in the summer. I am not sure of the plant’s life cycle, but by this time the stems may have started to send some of the energy created during the summer back to the root systems. Nevertheless, given how much of the root systems can be pulled up, I still feel as though we are making long-term progress. 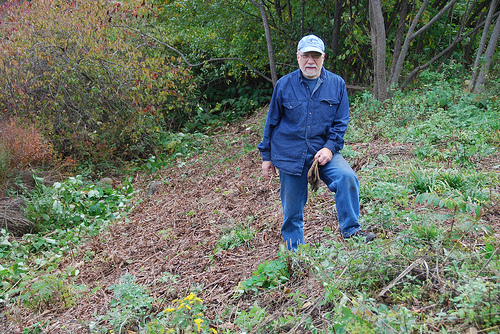 One more task that needs to be done to completely clear the east side of the project area is to weed out sporadic shoots of JKW that have sprouted up among the weeds and wildflowers that are now growing prolifically at the top of the eastern bank. Although JKW, when it becomes thick, will shade out and destroy virtually all other surrounding vegetation, it obviously does not work the other way around. As long as there are bits of root system in the soil, the JKW shoots will make their way through them and up into the sunlight. Looking forward, I still have in mind the possibility of continuing the “cut, cut, cut” strategy further up and down the edges of the bike path since that seems by far the most efficient long-term way to battle the JKW. As an experiment, I purchased a machete today from Ace Hardware ($15-16) and will try it out soon to see how well it works. If it does prove useful, perhaps the purchase will qualify for reimbursement and can be used in the upcoming meadow-clearing effort. - John B. · Bottom of the bank that was most recently uncovered and planted with the native seed mix by Sandra Ruggiero and her Waldorf High School troops. 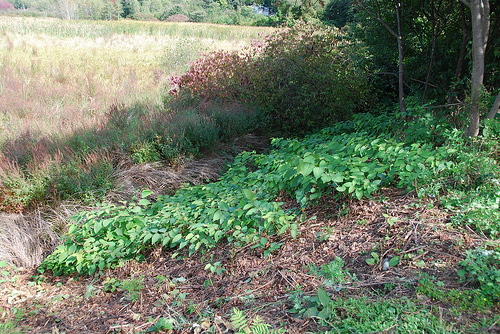 The upper areas of that bank, where the black plastic cover was in place for four or five years remain remarkably knotweed-free. That length of covering time definitely seems to be enough to eradicate any remaining living rhizomes immediately underneath the plastic. However, at the lower border of the bank next to the wetlands, which probably did not get adequate cover, the JKW was re-growing in profusion. · Throughout the area from which the plastic was earlier removed, and that has been planted with native grasses for two or three years now. This area has continued to experience considerable sprouting of new JKW plants from underlying rhizomes, or remnants of them, that were left after the JKW was initially dug out a number of years ago. At tentative conclusion is that the 1-2 years that this area was covered in black plastic is not long enough to destroy the rhizomes. Keeping the JKW out of this area will be tedious and difficult. 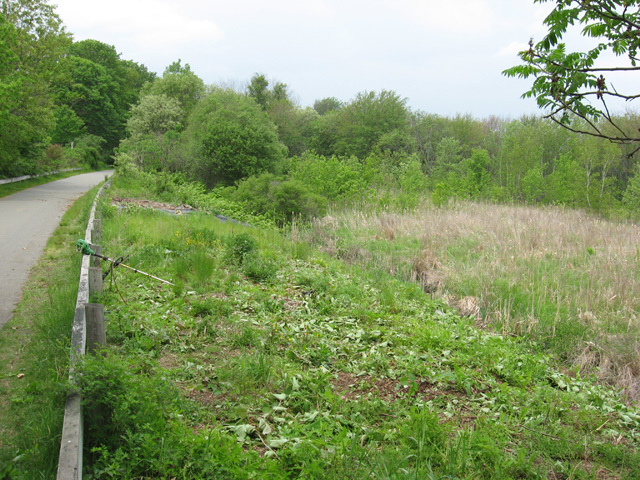 · Most of the “top of the bank” (as well as a portion of the bank further down) to the right (or East) of the replanted area. Perhaps because this area was not cleaned out as thoroughly as might have been desired last year, there was quite a bit of new growth, on both sides of the wooden rail bordering the bike path. JKW plants were 2-3 feet high and interspersed among a profusion of other wildflowers, meadow grasses that have spread from the planted area, and other weeds and plants. We removed a very large quantity of these plants, perhaps adding 4 feet to the massive storage/composting pile on the far east side of the plot. I also removed a number of sumac “tree-lets” that are spreading swiftly westward from the tree line and grown anywhere from 2-3 feet to 4-5 feet in height just this spring. I would say that somewhere between 50% and 75% of the JKW plants, depending on location, can be uprooted with relative ease. The remaining 25-50% are obviously sprouting from much healthier underlying root systems and had to be broken off at ground level rather than uprooted. The effect of breaking stalks off at ground level is similar to cutting but can be done more selectively without cutting down neighboring plant material. With this work completed, the visual appearance of this area from the bike path looks terrific and offers a marvelous view of the eastern portion of AGM. Now that the top of the bank on the eastern portion of the plot has been cleared, we could continue to use the “pull, pull, pull” method on the more profuse JKW growing at the bottom of the bank. However, for efficiency’s sake, and because there is much less other plant material here, I think it would make more sense to go back to the “cut, cut, cut” procedure for this area. A few more seasons of cutting should definitely weaken and thin the JKW in this area and make future pulling much easier. Mike, I wonder if I might have access again before too much time elapses this summer to the CLC weed whacker. Alternatively, it occurred to me that I might be able to buy a machete somewhere that could be used to cut down the larger JKW stalks on the lower part of the bank broad-scale, and also to begin to venture into the wooded area farther to the east. - John B. 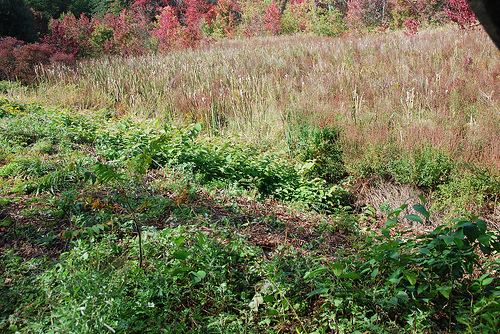 Before: New JKW growth in the "cut, cut, cut" area below the waste pile. To bring everyone up to date on our project, we assembled a crew of six on Columbus Day and pulled most of the JKW out of our “cut, cut, cut” area (to the east of the mid-section planted in grass). Not all of it could be uprooted, but I would say that 75-80% of the plants came up with at least 3-4” of root mass, in some cases much more. About 10% of these uprooted plants showed visible signs of the white fungus I documented earlier. Where the plant could not be uprooted, we simply broke off the stems at ground level. 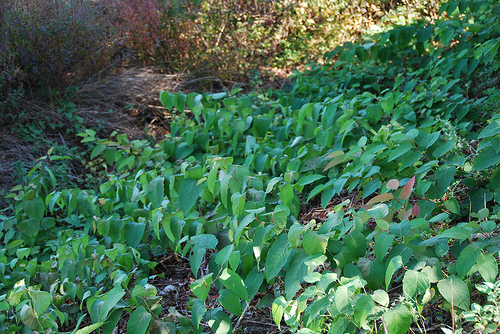 The removed plants were left in piles on-site to compost. There are obviously still root masses and rhizomes deeper underground from which the uprooted plants were growing. It is my educated guess, however, that the rhizomes won’t long survive, and that they will soon succumb in their entirety to the fungus and rotting process we have observed. Moldy remnants of JKW rhizome. In case this didn’t sink in the first time, let me try again. We really seem to be at a turning point on the JKW project! I stopped by at the site again yesterday evening and reconfirmed what I had experienced the week before. On the east side of the grassy area, it is now possible to remove much of the JKW (about 60-70%) that has been subjected to repeated cutting simply by giving a firm grasp to the plant close to the ground and pulling it up in its entirety, roots and all. Significant chunks of rhizome come out with the plant. In about a half-hour, I was able to clear out as stretch of bank about ten feet wide and almost all the way down to the bottom of the bank. Again, I added significantly to the waste pile. I bet we could easily clear out most of the bank this fall. I suppose I can do all the pulling by myself, a little at a time, but if anyone else wants to join me or give it a try on their own, the help would be welcome. If enough native plants grow in to hold the soil, it won’t be necessary to plant special grass. I am pleased to report, based on a couple of evening visits to the JKW site this week, that the “cut, cut, cut” method finally seems to be producing some very positive and encouraging results. Clearly, the repeated cutting of the JKW drastically weakens the root systems. Although the rhizomes still have life in them, and the capacity to send up new shoots, they just don’t have the resiliency of those in a healthy plant. 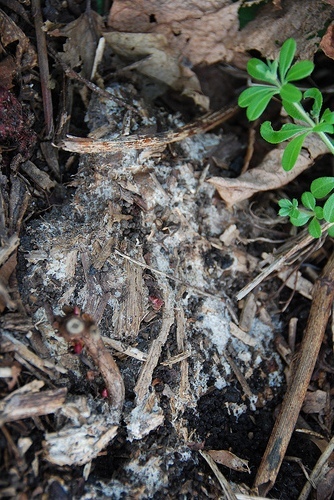 In many cases, you can actually see rotted and decaying rhizome masses and pieces of dead root in the ground. The relatively wet condition of the soil this fall (like last fall) also makes it easier to uproot the plants. To capitalize on this situation, I suggest we organize a “pulling party” later this fall, perhaps at the end of September or in early October, before the most recent growth dies back. I would bet that with three or four volunteers we could clear out most, if not all, of the area to the east of the plot in the middle that we re-planted with grass two years ago. If the 50-60% uprooting rate that I experienced at the top of the bank prevails farther down, there should still be enough JKW root systems left in the soil to prevent bank erosion, so I don’t think we need to worry about replanting this fall. We should have significantly less JKW in the area the next year, and I assume that other plants will naturally start to fill in the gaps. As I had promised Don, I spent several hours at the site this past Sunday afternoon, focusing primarily on the eastern side. On the top, flat part of the bank, I pulled by hand virtually all of the JKW that was growing among the other weeds and wildflowers, which have become very thick now. I added quite a bit to the big pile on the corner. Reaching through the weeds and finding the JKW stalks can be a bit of a challenge. However, I was encouraged to find that over half of the stalks came up by the roots – in some cases fairly easily, and in others only with a strong two-fisted tug and a little back strain. The remainder were more deeply rooted and had to be snapped off. After finishing off the top part of the bank, I weed-whacked the bottom part. Although the JKW there was not extremely tall, it was very thick and this was a strenuous job. Then, because the horseweed (I believe this is what Don calls it) at the top of the bank, about six feet high, was still blocking most of the view, I went ahead and chopped most of that down, leaving the wildflowers and the lower growth. With many hours of volunteer work the area has been cleared of JKW. But shoots continue to come up from the underground rhizomes and the area will require continued vigilance and work before the JKW can be said to be controlled. The picture below shows the view from the bikeway in 2004. 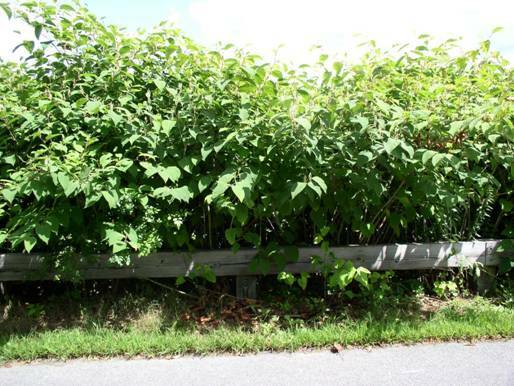 The area in AGM along the Eastern end of the Minuteman Bikeway has been heavily infested with Japanese Knotweed which has choked out all other vegetation and blocked what was once a very attractive view of the Meadows.